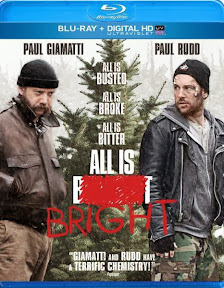 Similar to the way that ornaments and lights brighten up a Christmas tree, casting likable stars to play Christmas tree salesmen in Junebug helmer Phil Morrison’s melancholic holiday feature lightens up the tone of the otherwise darkly downbeat dramedy All Is Bright. 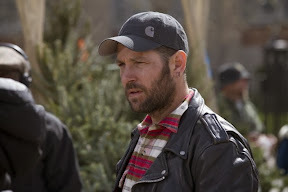 As two Canadian ex-crooks trying to go straight hustling trees for the month of December on a New York street corner, the pair of Pauls – Rudd and Giamatti – do some serious internal heavy-lifting, using their witty delivery and natural charisma to keep you invested in at times admittedly difficult-to-like script from TV’s Americans staff writer Melissa James Gibson. But because they can’t be expected to make up for every flaw in the tonally uneven film, All Is Bright delivers extra star wattage in the form of scene-stealer Sally Hawkins who not only steals every viewers’ heart but nearly walks away with the entire film as Olga, a no-nonsense Russian who first befriends Giamatti’s Dennis while negotiating a tree purchase and delivery. Having spent the last four years in jail, upon his release, veteran thief Dennis is crushed to discover that not only has his ex-wife (Amy Landecker) told his beloved daughter Michi that he’s dead but also that his family has moved on with someone else… in the form of his old partner-in-crime, Rene (Rudd). Determined to get his daughter a present and with no other prospects in a dire economy, Dennis forms an uneasy alliance with Rene on the right side of the law after Rene confesses his plan to spend his half of the money marrying Dennis’s ex. 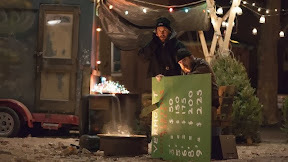 Facing stiff competition from Vermont tree farmers with gentle manners and a more professional display complete with music and decorations, Rene and Dennis rely on their old skill-sets to intimidate other sellers and fast-talk customers with money to burn. Relying on his comedy background as a Judd Apatow MVP in films such as Anchorman and This is 40, Rudd shines in his role, improvising complete with a Quebecois accent to schmooze passersby and generate sales. Yet as fun as those moments are, unfortunately, scenes of levity are all too fleeting as his character too gets bogged down with Dennis in the overwhelming depression of the struggling first half. Unbalanced and uneven at best, growing stronger as it builds on its characters to generate conflict, All Is Bright threatens to bore contemporary audiences completely and nearly does until Hawkins appears on the scene. While she befriends the two and Dennis in particular, what she gets from him exactly is unknown as he never does make a single, uninvited kind gesture towards her, which is one of the major problems with the script. Namely, we just don't like our leading men all that much. However, like Amy Adams in Junebug, Phil Morrison shoes that he knows how to let his leading ladies shine with some of Sally Hawkins’s best work since Happy-Go-Lucky. Intriguingly relying on accents – at least initially to generate humor – from Rudd’s French Canadian cookie-cutter stereotype to Olga’s blunt Russian, the two use accents to comedic advantage as part of their weaponry of charm, winning us over more due to their performances than the film does as a whole. Moving uneasily and manically in tone from gritty to sentimental -- while anyone familiar with basic plotting will be able to figure out how it will all end for Dennis’s Christmas present wish, ultimately the inspired whimsy of the final act’s Big Deal On Madonna Street twist on the film’s Gift of the Magi origin is just clever enough to make it worthy of a recommendation. Nicely transferred to Blu-ray by Anchor Bay and boasting an Ultraviolet digital copy of the film you can stream or download on multiple devices, while Giamatti and Rudd’s turns as men on Santa’s naughty list hoping to create their own version of nice is strong indeed, it’s too bad that the film couldn’t meet them halfway without making us wait halfway through it for things to start getting interesting. A strange blend of old-fashioned and new, although All Is Bright had the potential to be a modern day version of the type of film that was made so effectively well by Ernst Lubitsch or Preston Sturges in the ‘30s or ‘40s in the tale of an ex-con father trying to do right by a daughter who doesn’t even know he’s alive, the final result is a mixed bag at best.